While we appreciate the support of all of our consumers, counterfeit products are on the rise and we want to ensure that you are purchasing a 100% authentic. Our products are protected by registrations, trademarks and copyrights and we work hard with our legal team to protect our brand from infringements. To better help ensure that you are purchasing an authentic. Product, please look for the following signs. Our packaging will never contain spelling mistakes or grammatical errors. 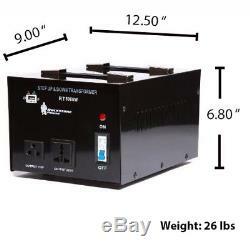 5000 Watts Heavy Duty Step Up/Down Voltage Transformer Converter. Step Up Voltage from 110-120 Volts to 220-240 Volts. Step Down Voltage from 220-240 Volts to 110-120 Volts. Patented Simultaneous 3-Mode Output: 5V USB Port / 120V USA Output Socket / 220V Universal Output Socket. Full Range Over Current Protection. RockStone Power proudly supports the United States Military since 2001. For safety reasons, it's recommended to use a Voltage Converter/Transformer that's max watts is at least 50% higher than your appliance. For example; 5,000 transformer can be only be used with an appliance that uses up to 3,300 Watts that is to prevent damage from the transformer itself and the appliance being used. 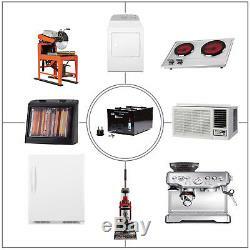 Package Contents: Rockstone Power® 5000 Watt Heavy Duty Voltage Transformer Converter, Hardwired Heavy Duty Insulated Power Cord with USA Grounded 3-Prong Plug, American to European Grounded Schuko Wall Outlet Plug Adapter, 2 PCS Spare Fuses, and Instruction Manual. Rockstone Power takes pride in being an industry leader in Quality, Technology and Innovation, our factory is the global leader and one of the largest manufacturers in the industry. Or Step Down Voltage from 220-240 Volts to 110-120 Volts. ON/OFF Switch with LED indicator light. 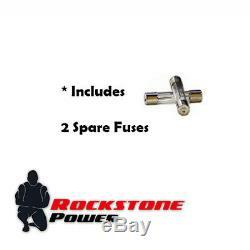 Hardwired heavy-duty insulated power cord with USA Grounded 3-Prong Plug. Rockstone Power Heavy Duty Step Up/Down Transformers aka Voltage Converters, Voltage Transformers, Power Converters, Step Up Converters, Step Down Converters, Dual Voltage Transformers, are meant for worldwide use for all electronics, heavy duty machines, or household & industrial applications. S recommended to use a Voltage Converter / Transformer that's max watts is at least 50% higher than your appliance. Some appliances, such as heating appliances, power tools, motors, laser printers and TVs, require 2-4 times more watts at start up than the printed rated wattage. What's in the Box. 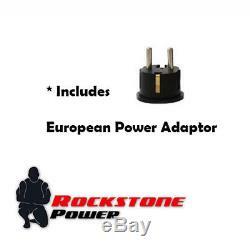 Rockstone Power 5000 Watt Heavy Duty Step Up/Down Voltage Transformer Converter - American to European Grounded Schuko Wall Outlet Plug Adapter - 2 PCS Spare Fuses - Instruction Manual. Friendly Reminder: Please always be sure to use your product as directed. Contact our friendly support team for quick solutions. Unauthorized reselling of E Depot Express items is prohibited. Further delay may void your return. At E Depot Express we take a different approach to the market. We do not play the cheapest game. Instead, we partner with top-notch manufacturers, use best parts, perform stringent quality control, all to deliver real long-lasting products to our customers, while still at a great price. On top of the high quality, we also stand behind our products to provide great service. Our products may fail 1 in 1000, but our service will not. All together, we strive to provide the best products and an amazing online shopping experience to every customer. 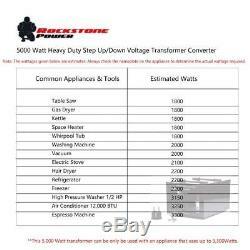 The item "Rockstone Power 5000 Watt Heavy Duty Step Up/Down Voltage Transformer Converter" is in sale since Wednesday, March 30, 2016. 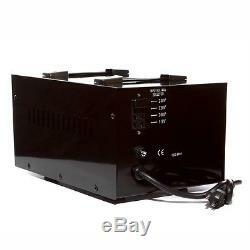 This item is in the category "Consumer Electronics\Multipurpose Batteries & Power\Heavy-Duty Voltage Converters". 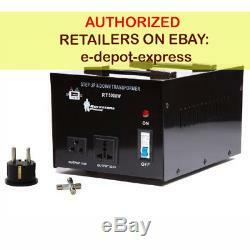 The seller is "e-depot-express" and is located in La Puente, California. This item can be shipped to United States.